I always thought the scale of the Moorish Rug seemed off. It just made the room seem a million times smaller, and since our living room is already small I definitely didn’t want to give the illusion of being even smaller. You get me, right? So you’d understand if I bought ANOTHER rug, right? Well luckily my husband knows me very well and has become accustomed to my buying and returning shopping habit. So with his blessing, I purchased this 8 x 10 trellis rug from Overstock. After I measured the room, I really felt like 8 x 10 would be a perfect fit! I think it makes a huge difference! Wouldn’t you agree? It’s ridiculously soft and plushy. Oh and in case you forgot this is what the room used to look like before. I was so excited to see you had purchased this one. I was looking at it but couldn’t decide whether or not to buy it. I bought the rug and hook trellis from Overstock (I think you bought that one earlier but it was too small) and liked it so much, I wanted one for my den as well. Seeing it in your living room and getting a closer look convinced me. This one is my favorite in your space. Looks great! Hey, love your style! Just found your blog googling overstock email notifications, ha! I’ve been thinking of buying this rug and after seeing it in your living room I’m sold! 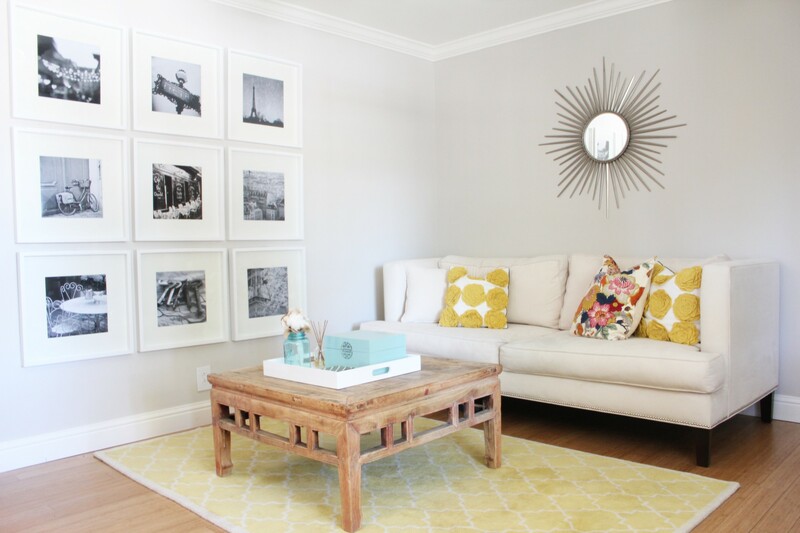 Also, I’ve been wanting to hang 8 ribba frames above my sofa ever since I saw it on YHL’s blog. But again, yours has me sold because it looks so great! I would love your advice though before I try it all out together. I have a cognac leather nailhead trim sofa set (pretty tradition looking) and I was nervous that the rug and/or frames would clash. I think the rug is okay but am more worried about the frames looking too modern. I like mixing different styles though so I’m not sure. Any adivce you have would be appreciated thanks!!! I love the idea of mixing modern with traditional. I think even if you added more traditional art in the frames it would tie in well. You really can’t beat the price on the Ikea frames too! Were there other frames you were thinking about getting instead? The rug from overstock is so nice and I love the large pattern, it really works well in making a small room seem larger too. Thanks so much for your advice, great idea to keep the art more traditional! I haven’t seen any other frams that I like besides the Ribbas and like you said – can’t beat the price. I did see that they’re available in a walnut finish which might work better. The annoying thing is that I don’t live close to an Ikea, so I can’t just buy and return if they don’t work. I can’t wait to get the rug, it looks so perfect in your living room. I read some old posts and although the other ones were really cute, they don’t compare! Can you let me know what color you painted your walls? I love the rug!!! Hi! We painted the living room Benjamin Moore Revere Pewter 50% formula. Thank you so much for posting this! I bought this exact rug a few weeks ago, but were waiting to unroll it until we move into our new place. So it’s sitting in it’s packaging and I have been dying to see what it looks like! Now I’m really excited, it’s much more beautiful than I was expecting! Thank you! I’ve had my eye on this rug for FOREVER. It looks so great in your area. We’re building a house, so I’m waiting on purchasing a rug until it’s finished. I’ve read that the rug sheds like crazy though. How has it been for you? Thanks! I’ve been loving this rug! I haven’t had an issue with it shedding other than the normal shedding a wool rug does. It’s gorgeous! Wow – we just stumbled across your blog and LOVE your style. We actually found the rug you have in your living room, read your review, and found you THAT way. 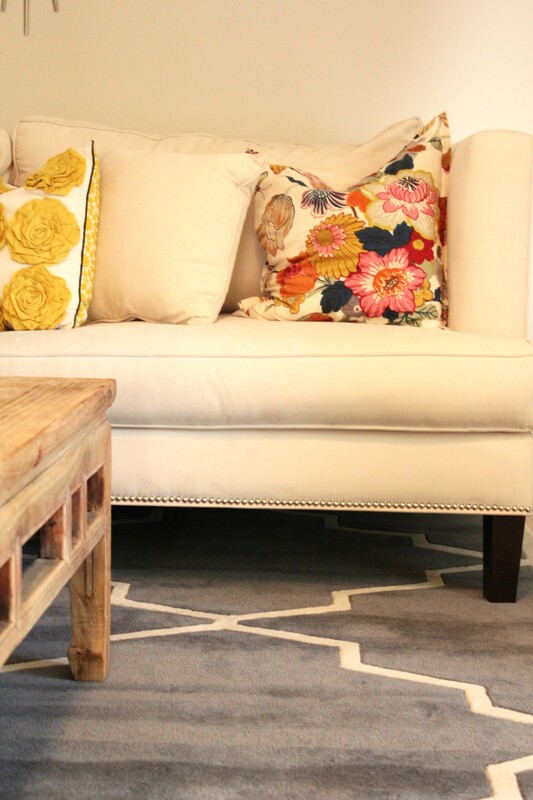 So tell us – is the rug blue, grey, or purple??? Do tell – we are building a family lake cabin and this could look perfect in our living room. Thanks! I would say it’s on the blue side, maybe a tiny bit grey. Definitely not purple. At least mine isnt! 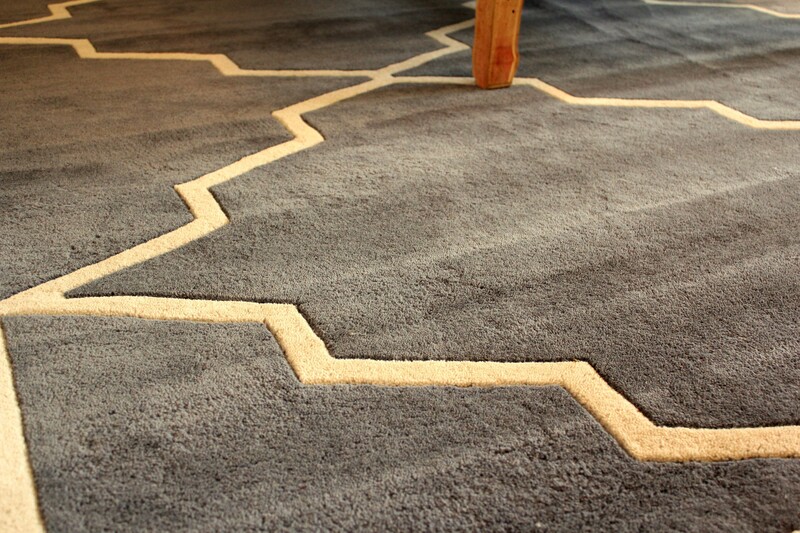 I love how this rug transformed your living room! Will you share where you got sunburst mirrow and silver chinese garden stool? I’ve been hunting for both with not much luck. Thank you for stopping by my blog. I just updated the House Tour page, so if you look there you can click the link for where I purchased the Chinese garden stool from. The sunburst mirror I purchased off Craigslist, I believe it was from Pier One a couple years ago. I found your website from your Overstock review and this carpet looks beautiful in your home! Seeing this photo makes me want to buy it now. Thanks for sharing! I found your website from Overstock. I’m considering the same rug. It looks great in your space! I’m also looking for a yellow-ish rug for another room. Where did you get the rug in your before pic? Thanks. Thanks so much for sharing! I followed your link from your overstock review and was SO curious to see it in action! I love it in your space. Is it really 8×11 or i it a little smaller? I ordered a rug from them to be 8×10 and it came out a little smaller at 7’8×9’8 which was a tad too small for my design. I have a large living room and dont want TOO much floor exposed. Also my couch is dark brown, and walls are a yellow beige. Will that match you think? This is the rug I ordered and its soooo pretty but its just too narrow at 7’7″ http://www.overstock.com/Home-Garden/Hand-tufted-Metro-Foral-Grey-Wool-Rug-8-x-10/5137508/product.html?rcmndsrc=2 the greys have brown undertones so it works in my space. 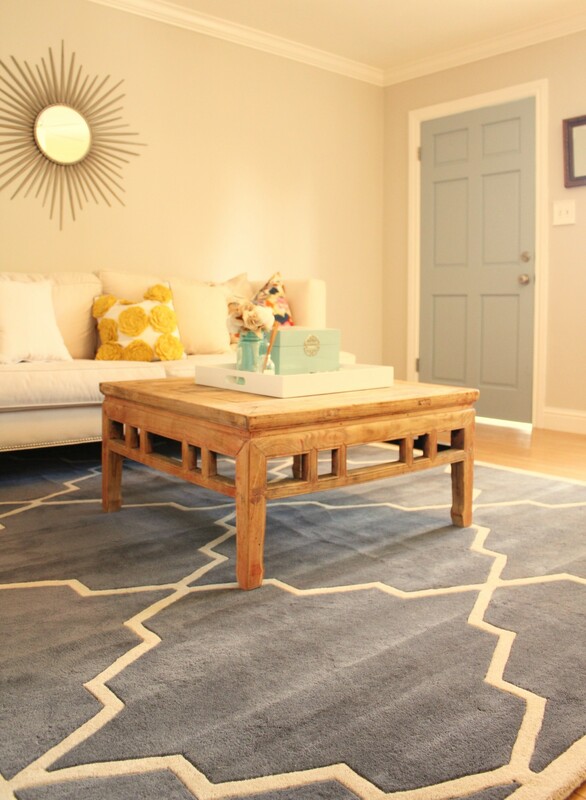 Ia m worried that your rug may be too blue (cool) and not match our warmer colors…what do you think? I too saw your O.co review. I actually work at Overstock on the website team and stumbled across your post because I adore that lattice rug. Funny thing is, I’m from Sunnyvale as well. Anyways, love browsing your blog – keep it up! Thanks for posting the link in your Overstock review. I don’t like to buy stuff sight unseen and this helps me get a better ‘feel’ for the rug and if it will work. I won’t order it until I get my new sofa to ensure they match but I appreciate the ‘real world’ photo! Your room is gorgeous! So glad I came across your review. I have been eyeing this rug on overstock for a while now and loved to see more photos to give me a better idea of what it would look like. My only problem is we have a dark gray (almost navy looking) couch, and we have 1 accent wall in the living room that is gray so I’m not sure if it will be to much gray? Hi Lizzie, As most of the commenters on here, I found your blog through Overstock and I also have a question about the rug. I know that the website says it is about 0.5 inches thick and I just wanted to know if that is accurate because I have only that amount of clearance in order for a door to swing open over top of it. Any info you could give me would be so helpful. PS. 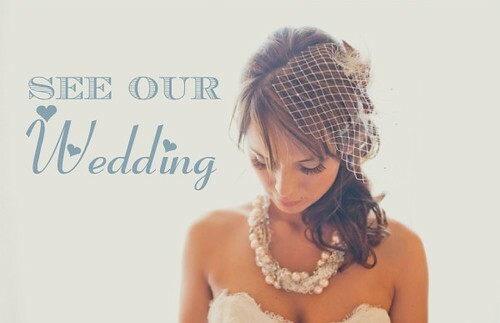 Love your blog and your house. This room is gorgeous! I’m contemplating the rug myself…or possibly a zebra in grey and off-white. Can you tell me, how large is your mirror? I’m contemplating getting this rug for our dining room, and in poking around online, I stumbled upon your cute blog! Hey!! Where’d you get your cool picture frames? I’m redecorating our family room and looking for a cheap place to get frames like that, to put some of our artsy pictures from SE Asia in! Ikea! They have the best frames and prices! So I found this post through your review of the rug on Overstock. You have a great blog and the rug looks beautiful in your room. I’m contemplating buying it myself. I’m wanting to redo our living room in a navy + neutral pallet. I’m looking for a greige-ish couch and I’d like to bring in fun navy prints on accent chairs, pillows etc. Having seen the rug in person, any thoughts on how that might work with this rug? Signing up to follow your blog now too. Funny! I have the yellow Pottery Barn rug and am looking to change things up. How has the blue one held up with the pets? The yellow has been a nightmare, so I’m looking for something that would be less likely to show stains. The white concerns me. Thanks!! The rug is definitely more of a blue gray, but still very pretty. I am looking at this rug for a baby girl nursery. The walls are a light lavender and white. 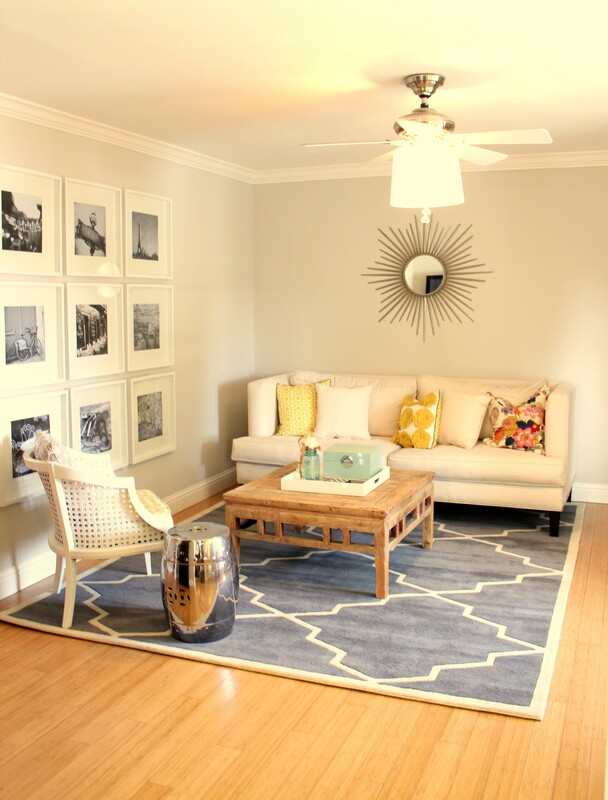 Do you think bluish in this rug will match? The rug is definitely on the blue side. I think it would look good, but it’s a personal preference and depends on what other colors you plan to bring in. I love your home and style!! Beautiful. I was wondering if you would share where you purchased your silver floor lamp? I love it! Congratulations by the way!!! Where did you get your couch? I love nailhead trim! Love this space! Makes me want to buy a white couch! But what I really want to know is where you got that gorgeous flower pillow?? Thank you Emily. The pillows are actually from Target. 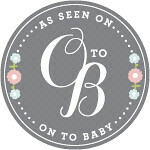 I just wanted to say thank you for linking this blogpost to the o.co review on the lovely rug! Your photos totally convinced me. I was a bit unsure as advertised pictures typically appear nicer than the actual product but seeing your detailed photos it looks to be a very nice color and looks thicker than I had imagined for this price! I just bought the 9×12 in this same rug for my wife and I’s new house. Have to wait a month until we can put it down! Thanks for your post, you definitely sold me on the pattern! Is there a nice backing to the rug? I don’t see it on the website. I have been swooning over this rug! I love it! It’s so pretty in your space! One question..some reviews said it sometimes looks purple. Have you experienced that? I’m looking for more of a steel blue/gray. Thanks so much!